New East Oakland eatery goes beyond steam-table fare, adds to Oakland's burgeoning Filipino restaurant scene. Chris Duffey Charleen Caabay cooks up garlic noodles with shrimp. Hours: Wed.-Mon. 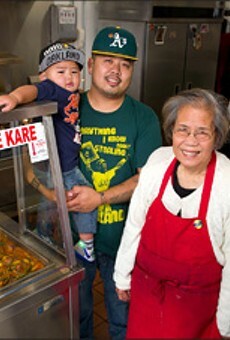 11 a.m.-8 p.m.
Could Filipino food be the next great global cuisine to make a name for itself in the Bay Area? It seems crazy to even consider the possibility that Pinoy restaurants, long relegated to ethnic enclaves in places like Vallejo and Union City, might join their Burmese and Laotian brethren (to name two other Asian cuisines that are relatively obscure in much of the United States) as must-visit destinations for Bay Area gastro-tourists. And perhaps we're getting ahead of ourselves: Two tiny, home-style restaurants in Oakland do not a culinary trend make. Still, the arrival of Kain'bigan in East Oakland this summer — and of Lucky Three Seven, just a five-minute drive away — means that East Bay aficionados of chicken adobo, lumpia, and other Filipino standards now have options. That's a step in the right direction. 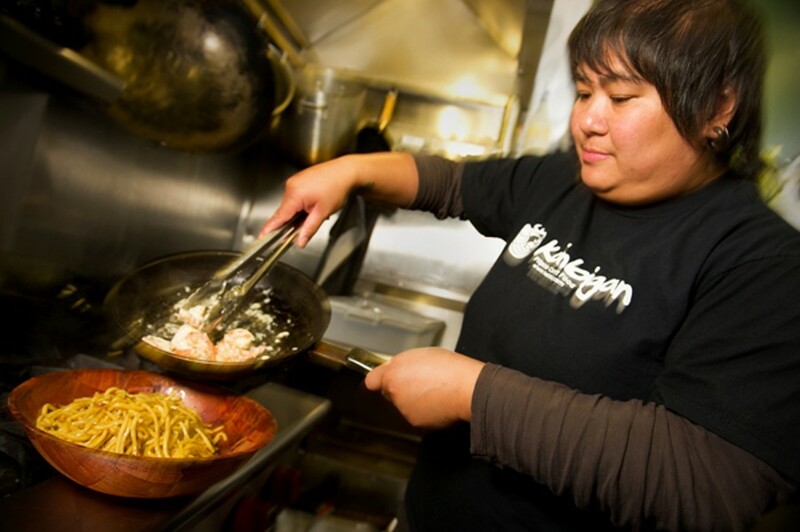 Kain'bigan is a labor of love for chef-owner Charleen Caabay, a self-taught cook who decided to leave the corporate grind to open a restaurant after several years on the local pop-up and catering circuit. Caabay said she took the leap in part because so many of her friends — second- and third-generation Filipinos — seemed increasingly detached from the culture. What better way to help stem that tide than through food? The restaurant's name, a play on words in Tagalog, translates to "Let's eat, my friends." And, despite being an order-at-the-counter kind of joint, Kain'bigan achieves the homey, welcoming feeling the phrase evokes — from the framed photos of island scenery on the wall, to the picnic-style faux-wood bowls in which the food is served, to the warm service. Most of the Filipino restaurants that I've eaten at in the United States have been steam-table operations, where most of the food is cooked in advance and kept warm for hours. Kain'bigan has a steam table, too, and features a handful of stews like pork adobo and the chicken afritada that hold up to the treatment. But Caabay said she wanted to introduce diners to the freshness of Filipino cuisine — the kind of cooking she experienced at fish and meat markets near the boardwalk in Manila, where you could pick out raw ingredients, walk them over to a restaurant just a few feet away, and have the kitchen cook them to your preference. So, probably about half the dishes at Kain'bigan are cooked to order in a hot wok. One of my favorites was the bistek fried rice — thin slices of beef chuck steak that had been marinated in acidic calamansi juice, stir-fried with sweet onions, then served over soy-sauce-soaked rice. Delivered to the table piping hot, this would hit the spot on a cold day. Just as enjoyable were the garlic shrimp, which were grilled to order on the stovetop, then drenched in a house-made garlic sauce, which Caabay likened to a calamansi-infused aioli. Double up on that garlicky goodness by ordering the shrimp over a bowl of buttery, toothsome garlic noodles, which are tossed in more garlic sauce. While the noodles weren't quite as intensely flavorful as Vietnamese versions of the dish I've had, they had the same addictive quality. Be forewarned, though, both the garlic noodles and the vegetarian pancit (stir-fried rice vermicelli) are priced like entrées, but they're best suited to serve as side dishes — the pancit, in particular, was rather bland. Shell out an extra four dollars for an add-on of pork, chicken adobo, or shrimp, and you'll wind up with more than enough food to feed two people. In fact, many of the dishes at Kain'bigan aren't just portioned to share; they're portioned to feed the whole damn potluck. Filipino food is perhaps most well known for saucy, meaty stews served over white rice, and Kain'bigan has its share of these, though this isn't the restaurant's strongest suit. The vinegar-based pork adobo was a solid-enough rendition, though I found it a bit salty and one-dimensional. I preferred the tomato-purée-based chicken afritada, which was full of chunks of tender thigh meat and carrots and potatoes that were cooked so soft they threatened to dissolve into the sauce. Another highlight was the lumpia (Filipino eggrolls), both a ground-chicken version and the larger vegetarian versions, which were filled with fresh chunks of green bean, cabbage, and almost-mashed potato. Caabay also has occasional specials, such as siningang and pork sisig. During my first visit, the kitchen was passing out samples of chicken sopas, the Filipino answer to the proverbial Jewish grandmother's chicken noodle soup, featuring a clean-tasting broth and big elbow macaroni cooked very, very soft. A squirt of fish sauce, as recommended by the friendly woman working the counter, added a nice hit of umami. It's tempting to compare Kain'bigan to Lucky Three Seven, which opened just a couple of months earlier. Both are casual spots with low prices and huge portions. If I'm being honest, nothing I ate at Kain'bigan was quite as interesting, or soulful, as the soupy chicken tinola and the coconut-milk-stewed taro leaves that I had during a recent visit to Lucky Three Seven. Kain'bigan isn't a place where you'll find unusual ingredients or out-there flavors. The menu is designed to be more of a survey of the cuisine's "greatest hits." Call it Filipino food for beginners — an entry point into a cuisine that's just starting to get mainstream recognition. Still, if I'm in the mood for something hot out of the wok or for fresh vegetables, Kain'bigan is where I'll go. There's room in the East Bay restaurant scene for both places, and it'd be great to see a higher-end option too — something like New York's Talde or San Francisco's long-lamented Poleng. Listen up, prospective Filipino restaurateurs: This is your time. Editor's Note: The original version of this article misstated the address for Kain'bigan. The correct address of the restaurant is 2101 14th Ave.
Lucky Three Seven, a low-key Filipino takeout joint, is the definition of an authentic Oakland eatery.